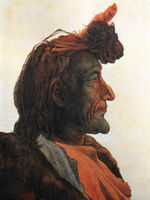 1 Caption: Watercolor on paper: Detail of Pioch-Kiäiu, Piegan Blackfeet Man by Karl Bodmer from his travel to the United States 1832-1834, painted August 21, 1833. 2 Have you ever wondered how tribes got their names? They are usually not names they call themselves. The names are often what others called a people. In the case of the Blackfoot, though, it is their name. 3 The Blackfoot call themselves "Siksika" which means Blackfoot. Some say it is because of their dark-coloured moccasins. Others say it because their moccasins were blackened from walking where prairie fires had burned the land. 4 The Blackfoot have always been a prairie nation. The men were hunters and warriors. They were often concerned with their spiritual side, as well as the ceremonies to go with it.